Including CLW, DLW, ICF, RCF & Rail Wheel Factory. The Director General and Ex-Officio General manager, RDSO, Lucknow. Central Organisation for Rly. Electrification, Allahabad. CAO/DLMW, Patiala and COFMOW, New Delhi. 2. 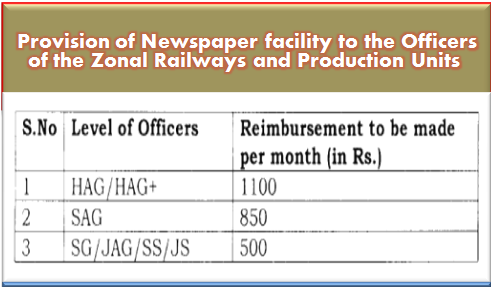 A certificate as per the annexure, to the effect that expenditure has been incurred on newspaper shall be provided by the officers on half yearly basis to the office for reimbursement. 3.As already intimated earlier, there shall be no subscription and circulation of newspapers and periodicals in the offices of such officers.